When we got together to discuss the Act at the Peckham Settlement back in April, I got quite excited. I’d lobbied for this back in the day, and now a previously dispirate bunch of activists from around the Borough were discussing its implementation with Southwark Council, supported by the Active Citizens Hub. What happened in the next few months showed just how low the Council’s opinion of its electorate is, but also offers a chance for activists to set the agenda over the next year. Liliana from the People’s Republic of Southwark has written a nice little potted history of the council’s appalling attempts to empower their community. What struck me most is the prevailing attitude from council officers, and most of all from the council leader Nick Stanton. Given that this Act is brand spanking new, and that nobody is quite sure how it works yet, I wouldn’t expect them to get it right the first time around. Given that the Act requires entirely new ways of engaging with the community – actually listening, discussing and reaching agreement rather than “consulting” – I wouldn’t expect them to get these structures working perfectly in the first year. But not only have they failed to promote the Act; not only did they fail to support citizens when they disagreed; not only did they assemble a Potemkin panel that broke all the rules; but they actually went out of their way to block our involvement, even trying to stop councillors and residents from observing panel meetings by locking the door! This year, we won’t let them get away with it. This small band of activists is working up a proposal for the council, showing them how we can work together to do this properly. If they fail, we’ll embarass them into taking notice. Active groups in Southwark are all busy, and rarely speak with one voice. This time we can challenge the council with a united message. When we publish a workable, realistic process for the Council, I hope we can get all the groups in Southwark to sign up and support it, even if that just means a name on the covering letter. Meanwhile, do contact Liliana as she suggests if you have any thoughts on what this process could look like. I’m going to be reviewing other councils to look for best practice. A perfect online place for all of your IT exam training. Get free ccnp brain dumps today or your mcitp certification books from us. You can also download best itil certification question and answers. Maybe it would be worth comparing notes on what happened it Lewisham and Southwark so both boroughs can improve things next time? I thought the citizens’ panel itself was reasonably well-organised in Lewisham (though the people on the panel rejected my proposal! ), but that much more could have been done in the months before to let local people know about the act and how to suggest proposals. Lewisham also rejected a lot of proposals that didn’t meet the criteria, but the positive thing about this was because in most cases it was because the Council already had the power to implement the proposals. So now campaigners can start asking questions about why the Council isn’t using some of its powers etc. I’m going to be doing exactly that over the next month. I’m looking for particularly good case studies so that we can both demonstrate our process is reasonable and put Southwark council officers in touch with those councils that did it well. Thanks for the thoughts from Lewisham, it certainly sounds a lot more positive! The Secertary of State has the power to send the council’s proposals back and have them start the procedure again – the problem with this is how does the community get the Secretary to do this? 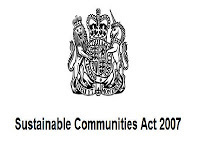 The next meeting of the active citizens’ review of the SCA is on Monday 14th September 6.30pm-8.30pm at Keyworth Centre, LSBU, Elephant & Castle. Please email SCA@nutbrook.demon.co.uk to ask for venue details and to say you are coming!